Getting ink requires you use your brain and heart. A tattoo is a permanent disfigurement of your flesh. Sure, there are lasers to remove them now, but it takes a long time, is painful and costly. Do not enter into this lightly. And know that what's cool now may not be cool later. If you have ink for the rest of your life, you'll be explaining its significance to your family, friends, lovers and employers. It's good to have some kind of story to go with it. A tattoo on your hand, neck or face might seem gangsta, but our society isn't quite in a place where that kind of thing is accepted with a shrug. If you can't hide the ink under a cuff or collar, that's a commitment above and beyond the norm. Is it hygenic and do the instruments get cleaned? 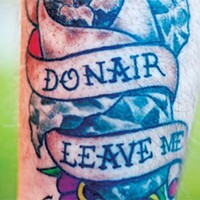 With the lack of tattoo regulation in Nova Scotia, it's the individual's responsibility to make sure the artist is clean and diligent. Look for an artist whose work matches what you like. Ask lots of questions and make sure you feel comfortable with the talent. Getting tattooed is surprisingly intimate, it's good to have a positive feeling about the artist. Tattooing is expensive, but it's also an investment in yourself. Artists charge by the hour, anywhere from $80 to $160. They may offer a flat rate for something small, or a deal may be swung if you're planning a long session. The longer the session the more it will hurt, as the initial adrenaline passes. The neck, the feet and especially the ribs are considered the most sensitive areas, but it varies from person to person. You won't want to do much following a long session except stay warm and maybe nap, and the skin under a fresh tattoo feels like you've had a bad sunburn and can swell. People cry in tattoo parlours, from fear as much as pain. That's OK. Bring a friend with you, an extra person in the studio is usually no big deal to the artist. Unless you provide the artist with an image and say, "This is what I want," a custom tattoo is a collaboration. It means once the ink goes into your flesh, you let go of a certain amount of control. Be OK with being the canvas and trust the artist. When you get a tattoo, your life will never be the same again.